You are going to have a lot of GREAT days at WildFire CrossFit. You feel great during the warm up, hit a new PR on your strength, and crush the workout! You are also going to have some days that challenge you. The warm up feels like the workout, you struggle with your form on the strength, and are sucking wind during the first 2 minutes of a 20-minute AMRAP. It’s how you handle the challenges that are going to define you as an athlete. Hold your head up high. Remember that you are always going to get another shot. Let these moments help you focus your training. When you know your weaknesses, you have something to work on outside of class, and our Team of Coaches are always available to help. Fitness is a journey. The skills and exercises we do in CrossFit take time, practice, and patience to become proficient. If it doesn’t challenge you, it doesn’t change you. Facing these challenges head on with a smile doesn’t just make you better at CrossFit, it makes you better at life…and THAT’s what we are really here for anyway! So next time you have a day that challenges you, remember those days that were GREAT, and as long as you continue to show up with a great attitude, ready to work your tail off, you are going to get incredible results!! Today is a great day to take on a new challenge with a CrossFit Benchmark workout! Lynn is a bit different from the traditional CrossFit workout where time is usually a factor. 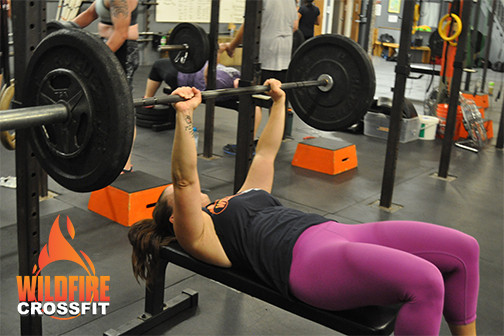 The workout is 5 Rounds For Max Reps of Bench Press (Bodyweight) & Pull Ups. You are allowed to rest between rounds. Think of this like a strength. The purpose is to recover so that you can stay somewhat consistent over the course of 5 rounds. As for the pull ups, you can perform any type of pull up you want as long as your chin gets over the bar each time. So, get into WildFire CrossFit for a new day a new challenge, and a lot of FUN!